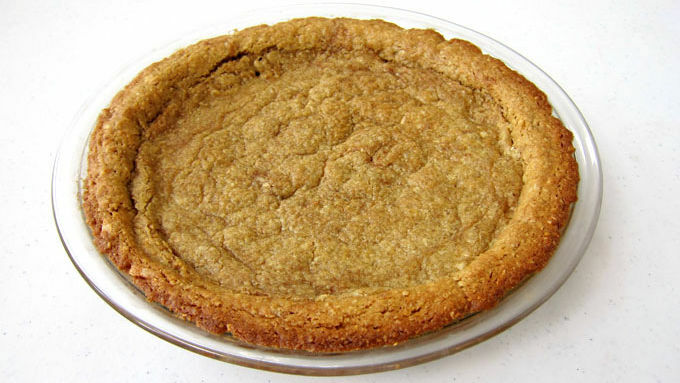 COOKIE CRUST: Preheat oven to 350°F. Stir together the cookie mix, water, butter, egg, cinnamon and almonds. Reserve 3/4 cup of the dough, then press the remaining dough in the bottom of a 9-inch pie pan to form the crust. Place the pie pan in the freezer for 15 minutes. Meanwhile, break the remaining dough into small pieces and scatter them on a baking sheet. Bake pieces for 10-12 minutes until golden brown. Remove and allow to cool completely, then crumble into small pieces. 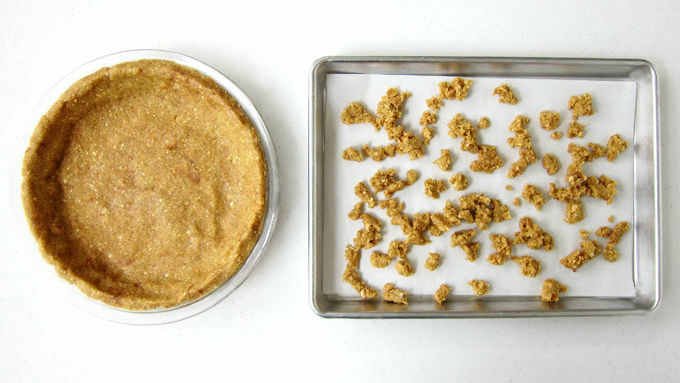 Bake the cookie crust for 18-22 minutes until golden brown. Remove from oven and allow to cool completely. If the crust has puffed up a lot during baking, press it down while still warm using the bottom of a glass. 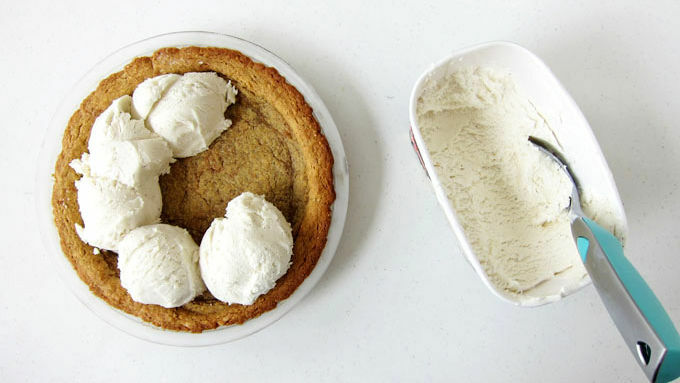 ICE CREAM LAYER: Scoop vanilla ice cream into the cooled crust. Cover and freeze for at least 2 hours. APPLE MIXTURE: Melt 4 tablespoons of butter in a skillet over medium heat. Add brown sugar and stir constantly until it begins to dissolve. Add apples and apple pie spice and toss to coat. Continue to stir until sugar completely dissolves. Reduce heat to medium-low and let apples simmer for 10-14 minutes, stirring occasionally until the apples are tender. Set a fine mesh sieve over a large bowl. 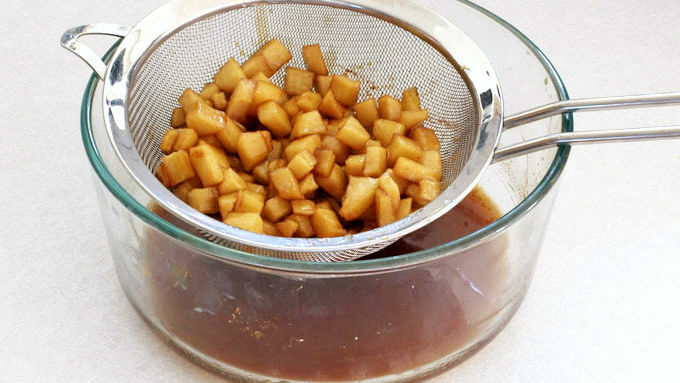 Pour hot apples into sieve and allow the caramel to drain off. Set apples aside to cool. 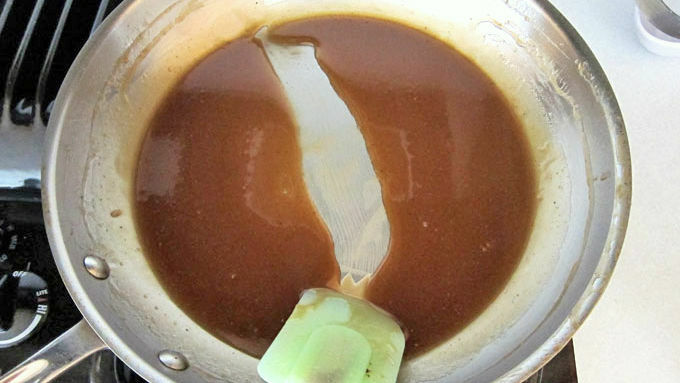 CARAMEL SAUCE: Return skillet to medium-low heat and add the remaining one tablespoon of butter. Once the butter melts, stir in flour and cook for 30 seconds. Add the caramel back into the pan and cook for 2-3 minutes until thickened. Remove from heat, pour into a heat-proof bowl and allow to cool completely. Just before serving, spoon the apples over the top of the ice cream, sprinkle on the cookie crumbles and drizzle the caramel sauce over top. If you are a fan of apple crisp à la mode, this dessert is for you. 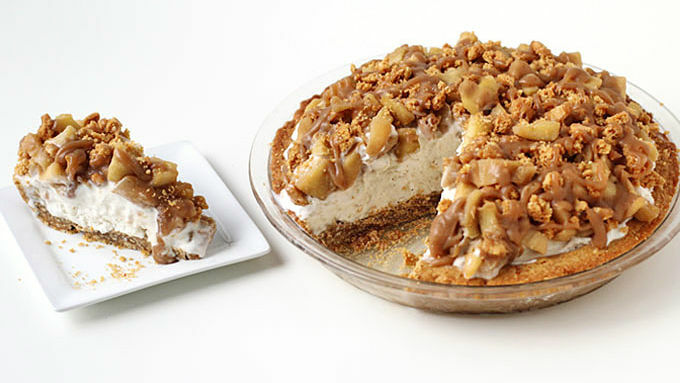 It combines all the wonderful flavors you love in one simple-to-make pie with an oatmeal cookie crust topped with vanilla ice cream, caramelized apples, and crunchy cookie crumbles. This dessert is easy enough to make on a weeknight, but would be decadent enough to serve at a party. To keep this dessert simple, the crust is made using a Betty Crocker™ Oatmeal Cookie Mix with a bit of chopped almonds and cinnamon tossed in for added crunch and flavor. You can freeze any leftovers, just know that the apples will be frozen too. 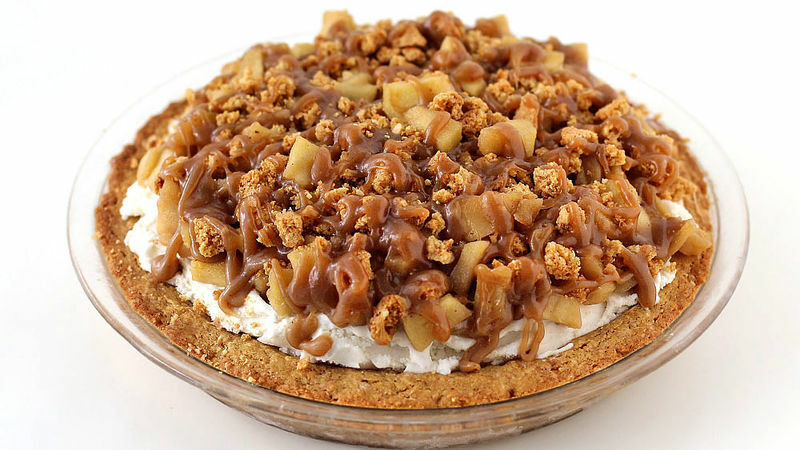 If you prefer, you can cut slices of the pie then top each slice with the apples, crumbles, and caramel sauce. Then just refrigerate the apples until you want another piece.